The CDi System boiler by Worcester Greenstar is the top performing system boiler in the entire range. It is ideally suited to large properties where there’s a bigger heating demand. Similarly to other Greenstar products, the System boiler is compatible with a wide range of optional controls. This allows for generous flexibility with your heating and hot water times and temperatures. The Greenstar CDi System boiler is wall mounting and offers good energy savings, particularly when combined with new generation intelligent controls. This boiler is also environmentally friendly thanks to low NOx and CO2 emissions. What’s more, it’s compatible with Greenskies solar panels. 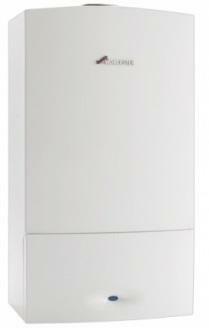 The Greenstar 30CDi System boiler provides a central heating output of 30kW and is 92 per cent efficient. The Worcester-Bosch Greenstar 30CDi System as the name suggests is a system boiler. This means that it is installed in conjunction with a hot water storage cylinder the capacity of which determines the amount of hot water that is available in your household but many of the major components are contained within the boiler unit itself. There is for example no requirement for a feed and expansion cistern. This means that the Worcester-Bosch Greenstar 30CDi System can be installed quickly and neatly in a medium or large family house and that the system overall is more efficient. Hot water is pumped from the boiler to the hot water cylinder and radiators resulting in faster response times and more economical running costs. The Worcester-Bosch Greenstar 30CDi System may be particularly appropriate for homes with more than one bathroom or where the mains water pressure is low. Being a Worcester-Bosch, this boiler is recommended by the Energy Saving Trust.